Our overview has the objective of making our study relevant to bioeconomists. The need for the ‘alternatives’ to the Synthetic Theory of Evolution in social-economic studies was substantiated, for example, by Colombatto (Journal of Bioeconomics, 5, 1–25, 2003), who maintains that the natural-selection theory is ‘ill suited’ to describing evolutionary processes in economics. He proposed an alternative ‘non-Darwinian’ approach by equating the ‘non-Darwinian’ approach with a definite version of neo-Lamarckism. Yet, as we will show, there is a palette of alternative approaches within and beyond the neo-Lamarckism. 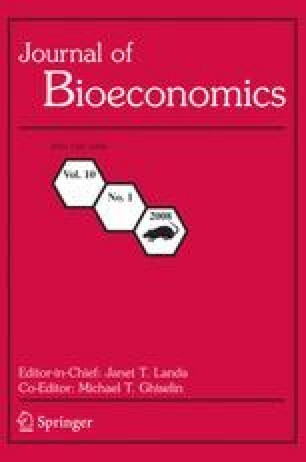 We hope to give bioeconomists more choice in their theoretical modeling and constructing of analogies between biology and economics. It will also be shown that in the light of suggested definitions the concept of ‘universal Darwinism’ recently discussed in bioeconomics makes little sense as a generalizing category. In addition, in the concluding part of the paper we demonstrate that the majority of alternative approaches are far from being pigeonholed as archaic and once and for all wiped off the theoretical landscape. On the contrary, in recent years one can observe some revival of interest in the theoretical ‘heresies’.